My WIP became a WIP in early January. Before that, it had been a UFO. I bought the pattern from Trish Burr as soon as I saw it on her website last summer. My thought was, I love it and it is very small so it will be quick. When it arrived, I was delighted with the design and lost no time putting all of the threads together so that I could start. 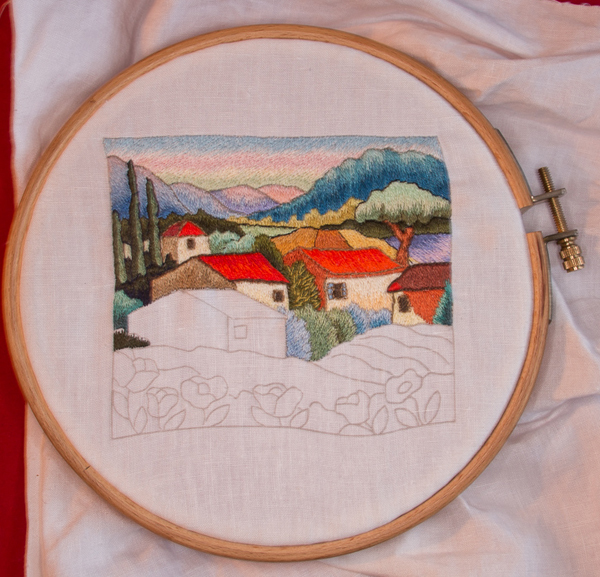 I stitched for thee evenings and had only two bands of colour completed on the sky! My thinking had now changed to, thank goodness it is small! I worked away at it until the sky was completed and then had to put it away to move on to making Christmas presents and completing guild projects. In January, when the UFO list for Virtual Threads was posted, Provencal was first on my list. I decided that I would work this piece until it was completed. I would just stitch and enjoy the process and not keep wishing it would get done. So far this is working for me, I stitch away and do not worry about how little I am accomplishing in an evening. The problem is, I love the piece so much I just want to carry on stitching it even when I know I have other items that need stitching for looming deadlines! 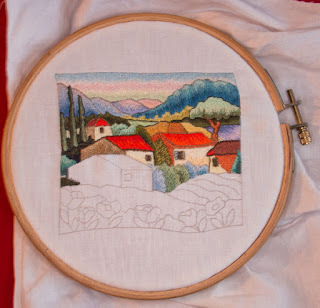 Last evening was the last stitch on Provencal until my deadline projects are finished, this took some serious self talk! I know that I will return to this WIP as soon as I can. 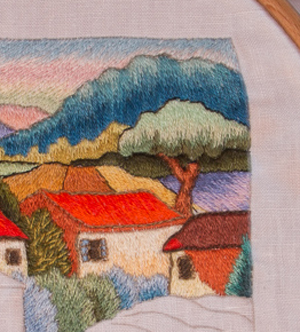 If you like thread painting, do take a look at Trish Burr’s website. She has some lovely designs and some must-have books. I will post an “All Done” photo when I get there. It is a beautiful piece Sue. Beautiful piece - enjoy the process! Thanks for sharing Sue. This is a beautiful picture and will be a real treasure once it's finished.